Mike Goldinger has done a lot of baking in his day. His father, Leopold Goldinger, a Holocaust survivor, owned the appropriately named Goldinger & Sons bakery in South Philadelphia, where Mike Goldinger also worked; he then spent a (regular) dozen years at Dawn Foods, a bakery product production and distribution company in Philadelphia, and, in 2002, he helped bake what was then the world’s largest hamantasch, weighing in at 738.5 pounds (a record since broken by a group of IDF soldiers). “It’s my way of giving back to my parents,” Goldinger said of his baking exploits. But even he was astounded at what was accomplished on Dec. 5 at Congregations of Shaare Shamayim. 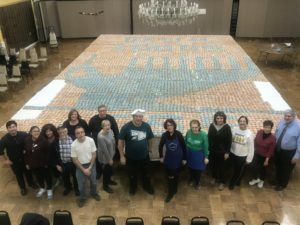 About 150 community members young and old were on hand to see (and subsequently dismantle) the world’s largest doughnut mosaic, created in celebration of Chanukah and certified by the Guinness Book of World Records. There were 8,067 doughnuts spread 12-by-25 across 27 plywood boards that took up about half of the auditorium. 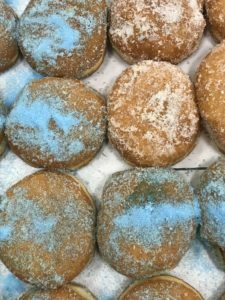 Using different colors of powdered sugar, volunteers were able to depict a lit menorah, “CSS” and “Dawn Foods,” which donated the doughnuts. About 720 were jelly-filled, also known as sufganiyot, while the rest were plain. After the mosaic idea was decided upon a few weeks before the event, the planners contacted Dawn Foods, which agreed to donate the needed materials; two days before the planned unveiling of the mosaic, the doughnuts had still not arrived. Finally, said Jerome Gabriel, they called back to let the planners know they were ready to be picked up. Gabriel, a paper cut artist by hobby for more than 20 years, was drafted to create the mosaic design — a request to which he happily obliged. Dec. 3 was dedicated almost entirely to creating a scale drawing to be placed over the plywood boards; the actual drawing took hours for a small group to complete. Meanwhile, Goldinger and a crew were baking the doughnuts, two dozen to a sheet pan for a minute and a half each while also making the colored sugars. On Dec. 5, the doughnuts had not yet been laid out. For the entire day, volunteers led by Goldinger and Gabriel laid out the doughnuts according to Gabriel’s drawings. “Everybody coming here over the last few days, creating this, is creating a sense of community,” Gabriel said. When congregants and community members started to trickle in around 6 p.m., there were still small sections bereft of doughnuts, waiting for Lurie, children and Republican City Councilman Al Taubenberger to make the final placements. They all happily obliged, and many participants had their photos taken in front of the sea of pastries. “Wherever Jacques says to be, that’s where I’m at,” said Taubenberger, who would later announce to the assemblage that he and the rest of the City Council would certify that the mosaic had set a record. “At Shaare Shamayim, we make everything look easy, but it wasn’t,” she said, motioning to the mosaic. She thanked Goldinger and her husband for their efforts. The crowd then descended on the doughnuts. Large brown bags fit about a dozen doughnuts, and many were happy to take a bag or two, along with a loosie for the road (freshly fried latkes were served as well). Goldinger said that the leftovers would be donated to elder care facilities, police stations and fire houses. Anna Eberman, a Russian parent ambassador with jkidphilly, attended with her sons, Isaac and David, and her mother, Marina, an employee of HIAS.